I've done the beauty box thing before - back when they started out first - and had mixed views on them at the time. Some months were better than others and overall, I didn't feel it was worth signing up to on a longer term basis. Since then, Glossybox have emailed me regularly, trying to tempt me with offers and in June, I took them up on one of these offers - the June box plus a free limited edition one. This was disappointing in the end - with cellulite cream, bright blue nail varnish & temporary tattoos standing out for me....hmmm?? The nieces got the lot, apart from the cellulite cream, which went to the charity shop. It's not that I don't have cellulite, it's because I don't care that I do and anyway, I know there's not a cream in the world that will make much of a difference. I immediately cancelled the subscription. But I was too late to prevent the July box from arriving but it turned out to be a good thing as it was FAB! 1. Full size Lollipops Lip Balm Dèlicieuse which is a gorgeous lip balm that looks a little like a gloss when it's on but isn't sticky at all. Very pleasant and handy to have in the handbag. 2. Teoxane Cosmeceuticals Perfect Skin Refiner 15ml. This is full of hylaronic acid and glycolic acid and is apparently going to make me look younger. I've used it for about a week now and it's lovely in texture...not sure if I look younger but I live in hope. 3. Noxidoxi Enhancing Serum Base 25ml, which is packed full of moisturising agents and antioxidants. Again, I've been using for a week now under my moisturiser. Time will tell if it makes any difference. 4. Sample size of Yves Rocher, Comme Une Evidence, Eau de Parfum. It's bigger than the usual little vials of perfume you get as samples but doesn't have an aerosol spray, though is still easy to apply. This was a huge hit with me. I'm really fussy about perfume and generally don't use anything other than Jo Malone but this has such a gorgeous French floral scent going on and makes me feel very sophisticated....and it lasts the day too! 5. 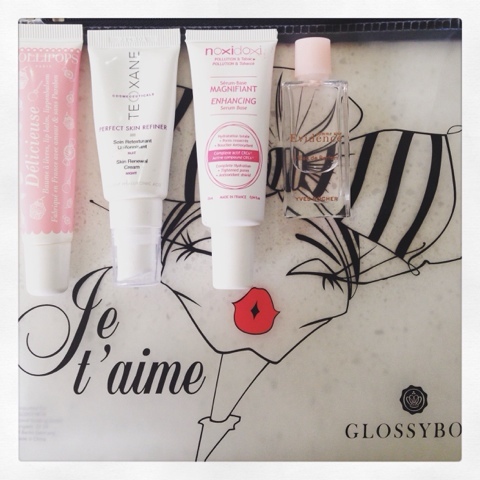 All of these items came inside the Glossybox Exclusive Travel Pouch which is made from opaque soft rubbery material with a French themed illustration - zipped on top. Not overly sturdy but perfect for travelling. 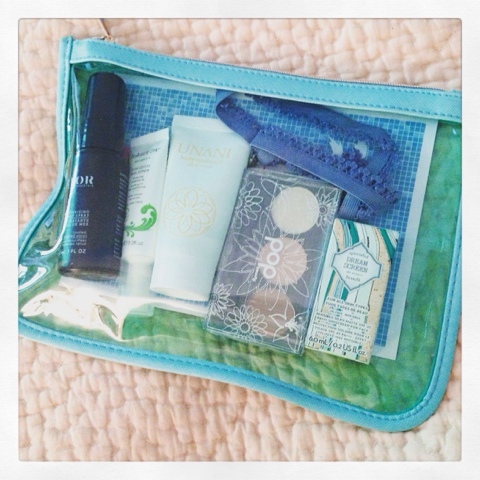 Moving to the Birchbox - which actually didn't come in a box this time but in a limited edition travel bag. This was good as I find the boxes a bit wasteful. It's not a huge bag but would be perfect for make-up when travelling or it would also work at the beach or pool for your phone/keys etc. 1. Balance Me Congested Skin Serum - 7ml. I love the natural and chemical free Balance Me products so I was delighted to see this in the bag. It's a calming gel containing aloe vera and lavender and is for those days when your skin feels like it's about to erupt...or already has. I love this product and have used it a few evenings before bedtime and can report back that it does seem to help. 2. Unani Aloe Vera Gel - 30ml. I'm not a big fan of Aloe Vera to be honest but it's handy to have some in case of sunburn/insect bites and this size is great for travelling. 3. Benefit Cosmetics Dream Screen SPF 45 in a 6ml sample size. This was the biggest surprise to me as I don't really rate Benefit for skincare. It's a lovely light texture and seems to disappear into the skin. No whiteness, no shine & no smell - amazing for an SPF of that level. It's lovely under make up though I did feel the need for a light moisturiser over it before applying make up - it's almost like a primer in that respect. However - it's loaded with chemicals and so it's not for me long-term. But nice to have this size of a sample to take away with me last week. 4. POP Beauty Eyeshadow Trio in Peach Parfait - so I'm generally underwhelmed by eyeshadows - I just don't get the fuss and anything other than a dark smoky eye on a night out just isn't for me. This was quite nice though and the instructions were good. You apply the lighter peach colour all over the eyelid, the darker colour on the crease and the light cream colour on the arch of the brow and the inner edge of the eye. Once I used my finger to blend it a bit and remove some, it actually looked quite nice. 5. PARLOR by Jeff Chastain Moisturising Sea Salt Spray - sample size. So this smells amazing and seems to do what it says on the tin...it's also free of everything that could be bad for you, including rather randomly - gluten (had to google this and apparently gluten in beauty products can affect some gluten intolerant people - every day's a school day!) The only problem with this product is that I don't want beach hair! Beach hair on me just looks like I slept in and forgot to look in the mirror - passing this one onto the nieces. So the conclusion I draw from this super scientific comparison of just one month's box is don't take any beauty box on a longer contract. Instead, follow one of the beauty box bloggers, like my favourite, Which Beauty Box and you will get advance reviews on each of the different beauty boxes (and there are loads more companies out there - other than the two I've reviewed here). If you like the look of one of them, sign up to one month and cancel once the box arrives. Do share any beauty box recommendations and tips you have - I'd love to hear about your own experience with beauty boxes...and it might inspire me to road test a few other companies too! www.latestinbeauty.com have really good value stand alone beauty boxes with a variety of themes plus I like the fact that you know the contents in advance. Some of them have 40% off at the moment. I always get the British Beauty Blogger boxes when they're available, got a great Clinique and a Givenchy box in the past year. My Little Paris was interesting to begin with but I prefer knowing contents in advance rather than building up a useless collection of nail polishes and face creams...I have enough of those already! I've always been intrigued by these as I just love getting that knock on the door with a delivery for me. But I'm not a big beauty kind of girl - I spend on clothes instead. But that little tip at the end is good - I like the idea of the "advance" reviews which at least means you know what you are in for. 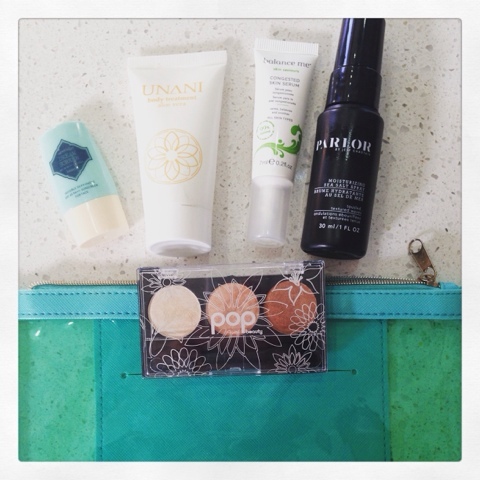 I think Birchbox and Latest in Beauty are my faves, though as you've discovered it really can be hit and miss! LIB do so many themed boxes and you can choose to just buy one rather than subscribe monthly. I'm not short of beauty products or I'd probably be tempted, but generally I'd prefer to put my cash towards the one thing I really want. I do think they make a gorgeous gift though, either as a one off or subscription. Oh I've also heard great things about My Little Box, a French one that's a bit more quirky.